3. Make lay-ups -- practice game like lay-ups, and shooting lay-ups differently. 4. Every pass counts -- demand accurate passes. 5. Make free throws -- if your team made of their lay-ups and free throws, how many more games would you win? 6. Expect accurate shooting -- practice making shots! 11. They don't care how much you know until they know how much you care. They believe in the pass more than they believe in their individual skill. They believe in the team more than the talent of the individual. They know positive energy breeds trust in each other and belief in each other. 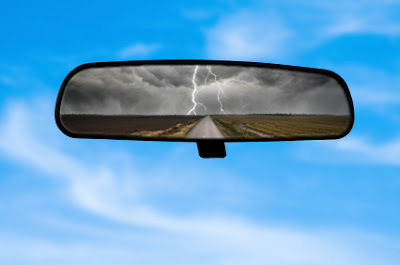 W. Edward Deming, the management and quality guru, said best when he told executives that managing a company by looking at financial data (lag measures) is the equivalent of "driving a care by looking in the rear view mirror." The following comes from "The 4 Disciplines of Execution" by Chris, McChesney, Sean Covey and Jim Huling. From the coaching stand point I think it means that we can't rely solely on statistics to advance our team. It's about relationship and developing players instead of just numbers. Paying to much attention to stats from former games keeps you living the in the past. Analyze the data, and then get to work on making players better. As those who follow my blog know, I am a big believer in the teaching methods of Nick Saban. First hand following during his tenure at LSU and learning about his thoughts on being "process oriented" has had a strong impact on my coaching experience. Coach Don Meyer would always speak at clinics and tell us that all coaches should study John Wooden. I think always coaches today should study Nick Saban. And, as Coach Meyer would be the first to point out, studying a coach doesn't mean we do everything that coach does. Look for those things that will apply to your program and your philosophy. Here is a video that I came across that we show our team next week before our first day of practice. I think it is simply incredible. The greatest of coaches are the great of communicators. They can hold an audience with their words and their actions. They can paint word pictures to help the audience visualize. You can sense the passion in their voices. They can take the complicated and communicate simply. Coach Saban is such a coach -- a teacher. Big thanks to Mike Neighbors at the University of Washington for sending this out via his email newsletter. I say this repeatedly but coaches are missing out if they don't sign up for it. No matter what anyone may tell you, your problems are not your problem. If you believe that something is a problem, then it is. However, if you believe that something is merely a temporary setback, an interim obstacle, or a solution in the making, then you don’t have a problem. • When you’re the head coach, you’re the head coach 24 hours a day, seven days a week. No matter what happens, it’s on your watch, and to a degree, it’s your problem. • Take care of the tiniest detail, because the little details add up until they represent significant differences. Let nothing slip through the cracks. • There’s no celebration of any victory in the past. Work for the next victory, the one yet to come. You cannot allow complacency. 1. They get to pick the question. You get to pick the answer. 2. You don’t have to answer any question you don’t want to. 3. Never lie or dissemble, of course; but beware of being too candid or open. 4. Never answer hypothetical questions about the future. 5. Never reveal the private advice you have given your superiors. 6. Answers should be directed to the message you want readers/viewers to get. The interviewers are not your audience. 7. They’re doing their job. You’re doing yours. But you’re the only one at risk. 8. Don’t predict or speculate about future events. 9. Beware of slang or one-liners unless you are consciously trying to produce a sound bite. 10. Don’t wash dirty linen. 11. Do not answer any question contain a premise you disagree with. 12. Don’t push yourself or be pushed into an answer you don’t want to give. 13. If trapped, be vague and mumble. 14. Never cough or shift your feet. 15. When there are second follow-up questions, you’re in trouble – break right, apply power, gain altitude, or eject. Here’s a “no-brainer” that a coach must always remember: leaders affect the behavior of the would-be/should-be followers. Let me express it in another way: players follow the coach’s lead. 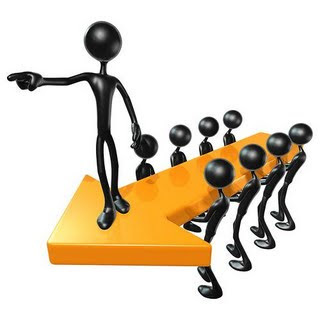 If the leadership is misguided, the “followers” will be lost – in a variety of ways. Or they will choose not to follow. Make no mistake about it, athletes not only need effective leadership, they also desire it. Young people want consistent parameters, direction, order, structure, organization, and discipline (to be defined and discussed in a later chapter). They need it, whether they know it or not. It gives them security, and that, in turn helps them to be more confident. A good friend who is an excellent high school coach asked me, "What are the five most important characteristics someone needs to be a success in this business?" Needless to say, that sent my mind in motion, as I'm always curious about what makes people successful in their fields. In fact, much of my reading revolves around this topic. I came up with different sets of 5's each time I thought about this, though several consistently made the list. One or more are characteristics that I think may be overlooked. 1. Respect -­‐ I believe that the greater respect the coach commands, the easier it is to ensure buy-­‐in from his or her players. And the more often you can get your team to buy in, the more you're going to see them do what you want them to do. I've always tried to gain respect by outworking others in the business and trying to learn as much as I can at the place and position I'm in. Work ethic and this continuing search for knowledge have been keys to my ability to gain respect. 4. 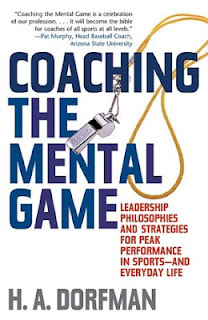 Ability to motivate -­‐ Motivation is an aspect of coaching that requires coaches to constantly "read" what's needed for their team and any given player on a daily basis. It also requires a great deal of thought and study in order to find new ways to accomplish these tasks. Find out what makes a player tick and then create ways to motivate him to get the most out of him each day. And be able to recognize when it's a new day that needs a new motivator -­‐-­‐ even for the same player who responded yesterday! 5. Choosing the right job -­‐ Make sure you know all you can about a job before taking it. I've often said that you have to find out if the expectations of the job exceed the reality of the job. Don't jump at a job that sounds good (to you or to others) or has a certain perceived prestige without learning all you can about the expectations and, frankly, why the job is available. This process takes significant soul searching, but it's extremely important. No one can be successful at a place that doesn't have or can't create an environment to succeed. Remember, too, that the place may be great, and you might even seem to be a good fit, but because of the timing, you need to pass it by. The reporter is the least important audience. Always remember, you are not talking to the reporter, but through the reporter to the people out there watching and listening. That said, be respectful of the reporter. In an interview situation there is no such thing as a dumb question. Putting down a reporter makes you look like a bully. On the coaching level, we can be interviewed by long-time journalist, part-time writers at a weekly paper, or a student at the school paper or radio station. 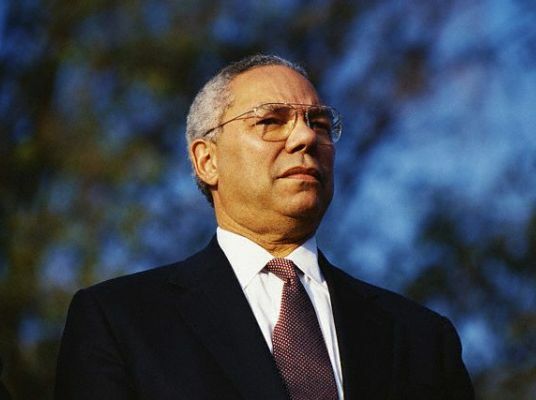 Powell's point of being respectful should be taken to heart. They want information, especially if their children and love ones are engaged in battle. 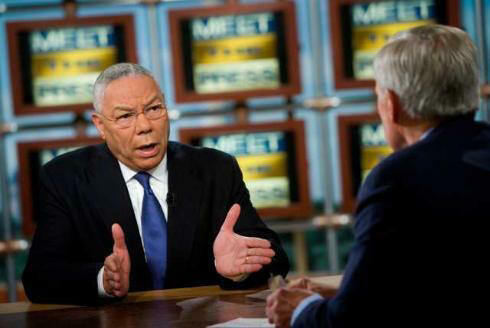 They want to have conveyed to them a sense of confidence and assuredness that their leaders know what they’re doing. They expect and deserve honesty. To me, the "American people" can be translated to the "fans of the sport we coach." It is important to understand by having access to the media, our responses can help us grow our game. 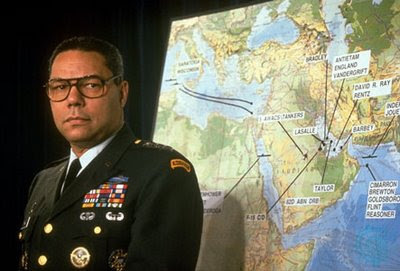 Everyone will have to comment and explain to their own people what you had said; in Desert Storm many of them had their own troops in the battle under U.S. command. To me, "political and military leaders" refer to "administration" -- both those at our school, conference office and the NCAA. They are looking for us to show maturity and integrity in our answers. You don’t want to give him anything he can use against you. 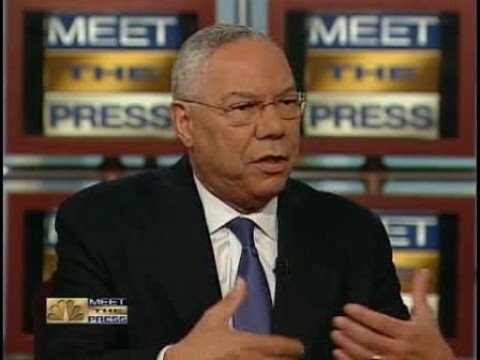 You need to be an expert at sliding away from questions like “Is it true we don’t have enough fuel to launch an operation?”…”Is it true that you are able to listen to Iraqi secure radio communications?”…”What about the report that you have special forces operating covertly in Baghdad?” Some of our necessarily vague responses terribly disappointed reporters. Of course, the "enemy" includes opposing coaches and players who are looking for bulletin board material. Don't give them anything to use. They have access to radio, television, print media and now the Internet. You are talking about their lives. You never try to spin this audience. First, it won’t work. Second, they are counting on you. They trust you, and you must never violate that trust. "Troops" refers to our own team -- -players and staff. Make no mistake about it -- your players will read the paper, listen to the radio and watch the television. Your words mean a great deal to them. "...working hard doesn't guarantee success. And hope isn't strategy." "If you want to improve your life, you must improve yourself." "Motivation gets you going -- discipline keeps you growing." Quoting James Allen - "Men are anxious to improve their circumstances but are unwilling to improve themselves." "If the right things happen in me, I can begin to control some of the things that happen outside of me." "When somebody tells you experience is the best teacher, that's not true. The best teacher is evaluated experience, which is reflection." "Successful people take every difficult experience and learn from it; unsuccessful people take difficult experience and leave it. They run, and they don't learn. So they repeat it again and again." "Value the process. It is going to take a long time, so you might as well enjoy the journey." "Asking why fires the imagination. It leads to discovery. It opens up options." "You must know yourself to grow yourself." "People say there are two great days in a person's life; the day you were born and the day you discover why." "...growth thrives in conducive surroundings." "Find somebody who does well and find out why they do well." "You must see value in yourself to add value to yourself." "If you lower your self-image, you won't go beyond it." 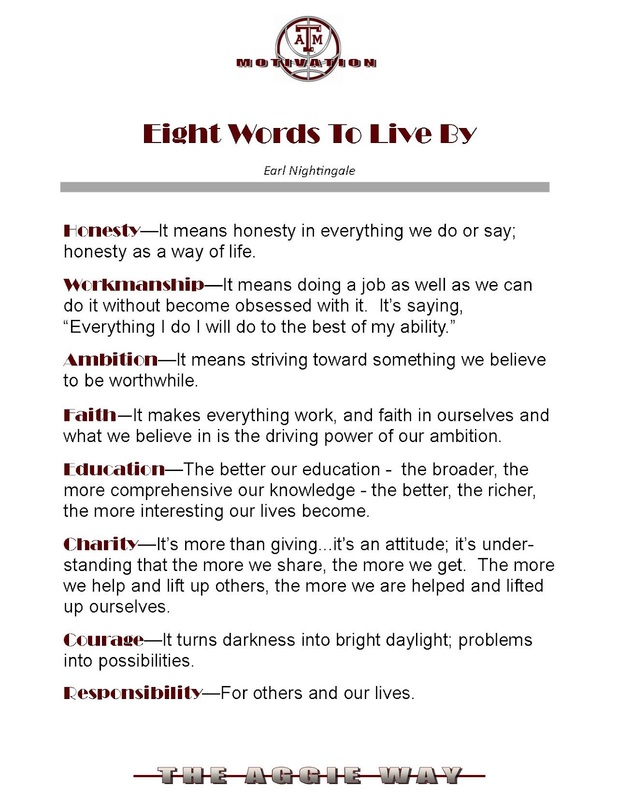 These are just a few snippets of an outstanding article in Success Magazine. If you don't subscribe, pick one of at the newsstand. All coaches should subscribe to Success. Incredibly well written articles each month along and a free CD with various speakers in each magazine. "Do not imagine yourself to be less than you are, not more than you are, but seek always to become all of which you are capable. Do not allow yourself to become arrogant or discourteous, for both are characteristics adopted by those who seek to cover their weaknesses. Do not spend time regretting the past, but invest that time wisely by preparing a better future. You are a fertile seed of the creator of all things, destined not to lie dormant, but to spring forth from the soil called life, and grown upward toward the unlimited horizons, overcoming all obstacles in the process. It is your destiny to tap your talents and to achieve all that of which you believe yourself to be worthy… to love more, anticipate more, overcome more, plan more, attract more, and to enjoy more than you ever dreamed possible. Such is the standard of life awaiting your mental decision and outstretched hand. You are deserving—you are becoming—you shall succeed." 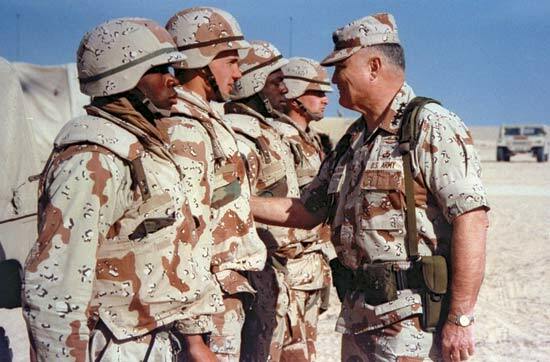 General Norman Schwarzkopf tells about his first experience of leadership at the Pentagon. His senior officer told him that to do his job well, all he had to do was to “Follow rule 13.” When he asked, “What is rule 13?” his commanding general said, “When placed in command, take charge!” when then Colonel Schwarzkopf asked, “But after I have taken charge, how do I make decisions?” His commanding officer said, “Simple. Use rule 14.” When Colonel Schwarzkopf asked, “What is rule 14?” he was told, “Do the right thing!” These are excellent ideas for you, as well. When placed in command, take charge, and if ever you are in doubt about what to do, simply do the right thing. 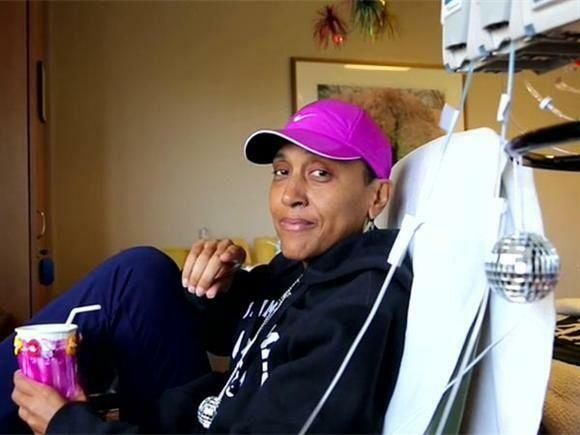 Ever notice how courage and attitude go hand in hand! "This journey is as much about the mind as it is the body, Your thoughts. Thoughts are so powerful. You've got to change the way you think in order to change the way you feel." Earlier I posted a blog about Steve Job's 7 Secrets to Success. I thought I'd take a brief look at them and attempt to let you know how I would apply them to the coaching profession. This one sounds easy but it's not. Many new coaches profess "I love coaching" until they get into long enough to know the number one aspect of this job is to solve problems. You can't hide from them or sweep them under the carpet. In fact, according to Job's formula, you must love to solve problems. There is so much more to coaching than just heading to the practice floor and putting on the suit for the big game. Will you truly love ALL the aspects that go into coaching? If you want to be successful and stay in it you will. The best way to put a dent in the universe is by molding the student-athletes you come in touch with. This goes far beyond teaching them a jump shot or how to post up. I absolutely love and work to implement Lou Holt'z mantra that he used while coaching -- "I'm don't coach you for four years, I'll coach you for forty." If you care enough to get involved with young people -- and that means helping them through some difficult obstacles -- you can make a special dent in the universe. Certainly this is a difficult thing to do in coaching. We hate to say no to things that can in someway effect our program -- promote our sport. But at the same time, they key concept here is to maintain focus and concentration. As Stephen Covey said, "The main thing is to keep the main thing the main thing." What are you doing to be a continual learner? Do you meet with others in your profession to grow your knowledge? Do you meet with those outside your profession -- to learn outside the box? Do you read? Do you watch DVD's -- listen to self-help CD's? Not only is the quest to learn a great way to increase what you know but it is a wonderful method for keeping you energized. To me, this means being process oriented as opposed to result oriented. I love the mantra here in the athletic department at Texas A&M. We don't say "Winning Championships" -- we say "Building Champions." Winning a championship is a destination. Building champions is an everyday objective. And it leads into all areas of life. Be a picture painted with your team or organization. The great teams I have been associated with have grown not just through playing basketball but in all the other experiences that come about from a well-organized program. As a coach, as a staff, if you pour your heart and soul into ALL phases of your program it becomes the most amazing experience and young woman or man can have at that age. But make no mistake -- there's a lot of work involved. This is about communication. 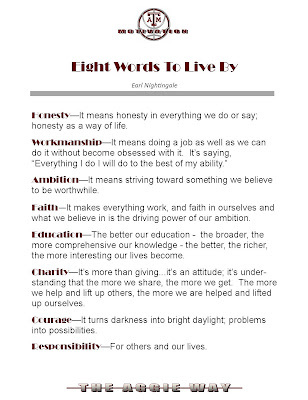 If I could again go back to a Covey thought, "Communicate is life's most important skill." You ability to properly communicate and present the parts of your program and your philosophy makes a tremendous difference in how it will be received by those you are looking to lead. First and foremost, do you believe in the message. Than are you knowledgeable about the message. Finally, can you enthusiastically involve your team in the message. 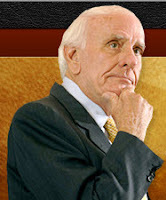 Business staffing pioneer Robert Half observed, “Laziness is a secret ingredient that goes into failure. But it’s only kept a secret from the person who fails.” People who success develop an attitude of tenacity. They refuse to quit, and they are determined not to let failure defeat them. If you desire to fulfill your dreams, achieve your goals, and live life to the fullest, that’s the kind of attitude you need to cultivate. Failure isn’t failure if you do better the next time. In Leaders on Leadership, Warren Bennis interviewed seventy of the nation’s top performers in numerous fields. None of them used the word failure to describe their mistakes. Instead they referred to learning experiences, tuition paid, detours, or opportunities for growth. You may think that’s a small difference, but that small difference can make a big difference. The way you think determines how you act. When it comes to the thing you love to do, the things you were made to do, aim high. The odds matter little. Whether you fall down along the way matters little. You fell when learning to walk, didn’t you? Maxwell Maltz, developer of psycho-cybernetics, says, “You are champion in the art of living if you reach only 65 percent of your goals.” Remember, if at first you don’t succeed, then know that you’re running about average. One of the best things you can do for yourself when you fail is to learn to laugh. “Sometimes you win and sometimes you learn.” (Robert Kiyosaki, Rich Dad, Poor Dad) That’s the mark of a great attitude! You don’t lose—you learn. Failure is just like success—it’s a day-to-day proves, not someplace you arrive one day. Failure is not a one-time event. It’s how you deal with life along the way. Successful people understand the role failure plays in achievement. That’s true in any life endeavor. Inventor Thomas Edison said, “I’m not discouraged because every wrong attempt discarded is another step forward.” And gold-medal-winning gymnast Mary Lou Retton asserted, “Achieving that goal is a good feeling, but to get there you have to also get through the failures. You’ve got to be able to pick yourself up and continue.” The farther you go, the more failures you experience. Never walk past a mistake. This is one of the first lessons drilled into young military leaders. To put it another way: make-on-the-spot corrections. This serves a number of purposes. First, and most obviously, correcting a mistake shows attention to detail and reinforces standards within an organization. Second, it teaches aspiring leaders to have the moral courage to speak out when standards are not being met. You never look the other way and pretend you didn't see it just to avoid a confrontation or to be seen as petty. Third, it shows the followers that you care about them, the unit, and its mission. If a follow knows that he has just made a mistake and gotten away with it, he loses confidence in the competence of the leader and has less respect for him. Fourth, you set the example for all of your subordinate leaders to act in the same manner. High standards and mutual respect will flow up and down the organization. Fifth, it keeps mistakes and screw-ups from moving to another level or, even worse, propagating. Take care of it now. Don't assume somebody will take care of it later...even if it's their responsibility. I spent some time this morning reviewing some of my notes from the Assistant Coaching Symposium sponsored by Felicia Hall Allen & Associates. It is one of my favorite events each year because of the uniqueness in which it is develop -- solely designed for helping assistant coaches grow. doing as many jobs as possible." Quite possibly the best advice I've heard for assistant coaches wanting to grow. We have received such great feedback in regard to our Gary Blair Coaching Academy that we conducted August 11-12 before our journey to Italy. Our foreign tour gave us a wonderful opportunity to utilize our team during the academy so that we give the coaches in attendance the best possible product. Another part of the academy that received a lot of positive feedback was our Coaching Academy Notebook. 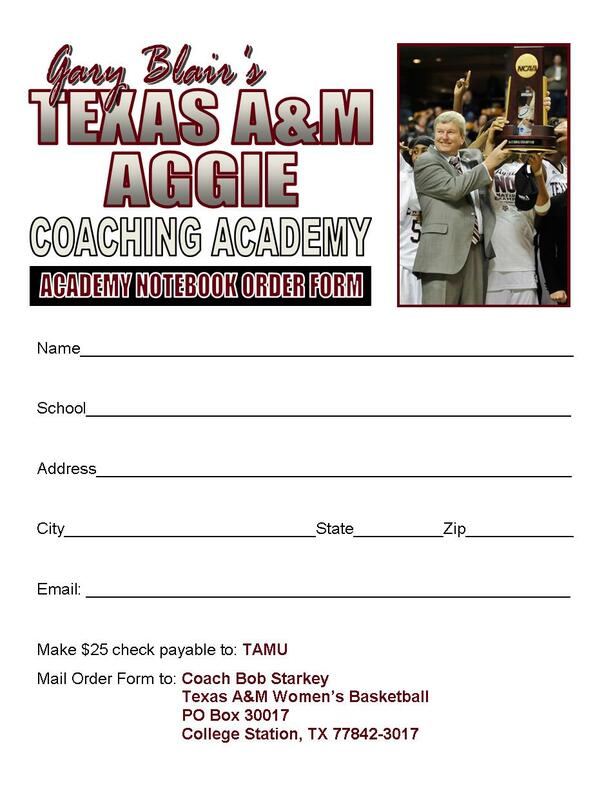 In fact, we have received a great number of requests for people unable to attend the Academy that wanted to purchase the notebook that we are going to sell the notebook to any coaches interested. The cost of the notebook will be $20 plus $5 for shipping. The only form of payment will be accepting will be a check or a money order. An order form is attached below. 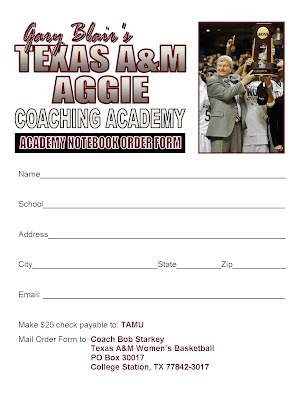 The notebook is divided into several sections including one on Coach Blair's Aggie practice philosophy. This section also includes a practice plan from a post player development workout, a practice plane from a perimeter player development workout, a defensive conditioning workout plan and a regular practice plan. Also included are 4 of Coach Blair's best quick hitters. 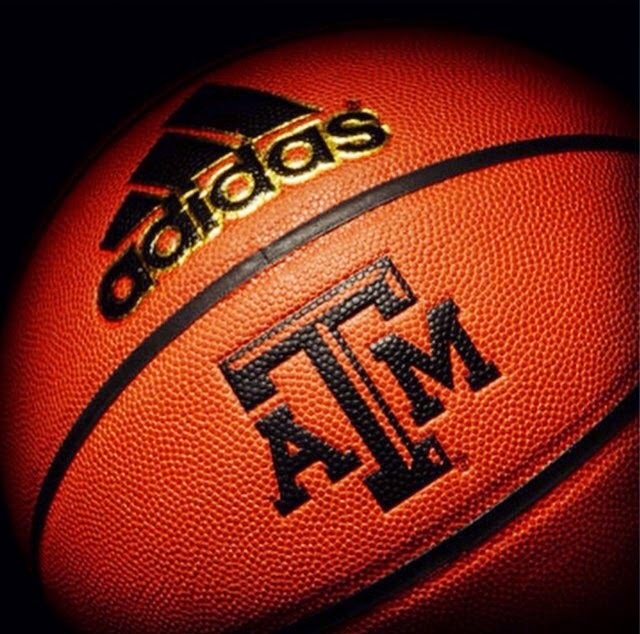 There is a section on leadership as well as one that includes 10 motivational passouts used by the Aggies. Finally, there is a section on scouting which includes the Aggie scouting philosophy, a blank report and a sample report. The notebook also has a note section which coaches can utilize to take notes. INCLUDED with the notebook are two DVDs. There is an actual DVD with clips from the practice sessions held during the Academy. You can following along with the drills on the practice plans provided to see what they actually look like on the court. There is also a highlight DVD from the Aggies' 2011 National Championship Season. So if you are interested in all of this, please clip on the form below, print it out, complete it and drop a check in before you mail it! If you could give a young person advice on how to achieve their dreams, what would it be? 1. Never quit anything you start. 2. Work harder than the other person. In 2008, Pat Williams, the GM of the Orlando Magic and a tremendous motivational speaker put out a book, "The Ultimate Coaches' Clinic." It is a fascinating book because of the style Pat utilized. He surveyed over 1000 coaches and administrators for insights to what is important to successfully do their job. It is a great book to own and I highly recommend it. Here are some thoughts from Pat Riley. • Impart the difference between belief and trust. Trust transcends belief. Your players must know what you are reliable and can help get them to where they want to go. • This is what happens whenever people on a team decide not to trust: Everyone will gear down their effort until they’re doing just enough to get by. They want, subconsciously, to enroll everyone else in their cycle of disappointment. • Complacency is the last hurdle any winner, any team must overcome before attaining potential greatness. Complacency is the success disease; it takes root when you’re feeling good about who you are and what you’ve achieved. • Coaching is overrated; leadership is not. to abandon his motion offense. 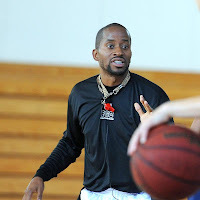 I greatly enjoyed speaking at the Kingwood Park Coaching Clinic this weekend. "Young players don't want to master one move -- they want to try and learn the full package at once." 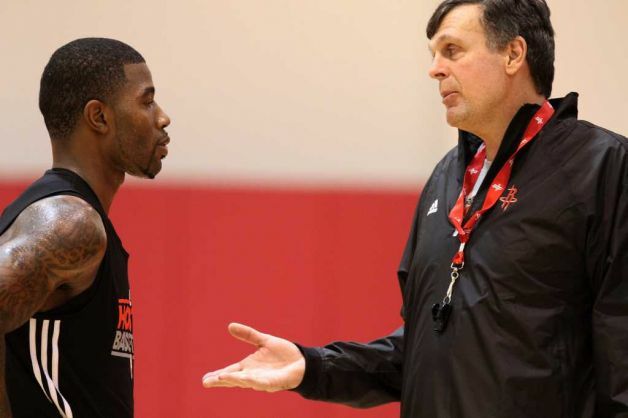 McHale talked about watching Dwight Howard shoot right-handed hook shots at pre-game workout and he went three for 10. He then switched to the left-handed jump hook. Why switch after a 3-10 effort -- stay and work until you get it 7 or 8 for 10. He talked about Kareem Abdul-Jabbar who beat team after team with the same old borring right hand sky hook from the right block. "The only way to get better in the post is to play and practice in the post." McHale talked about watching post players free shoot working on their 3's instead of their post game. Key to Boston's success is that they didn't care about the score. They wanted to beat you every possession. Red Auerbach to a young McHale: "You're going to be a good player buy how much better will you make your teammates?" 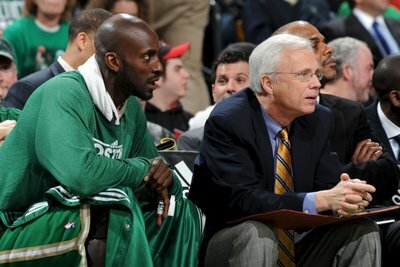 The thing that impresses McHale about a coach is when he can get he is team to play as one on defense. If your best player isn't your most committed, you're in trouble. 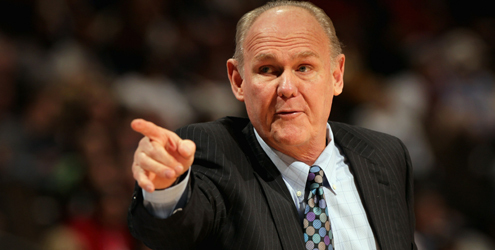 "Outside of my father, my high school coach was the most influential person in my life." "You have to spend time with people to gain their trust." McHale tries to have a daily conversation with each of his players. "If you not more talented, you must outwork your opponent." 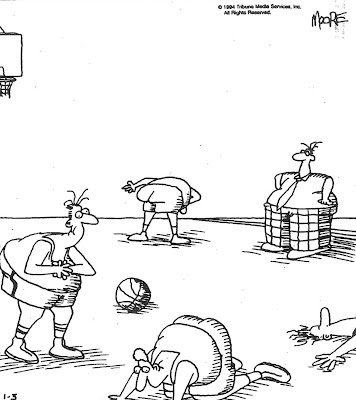 Must work on closeout drills every day. Best way to defend a re-screen is not allow the cutter to use it -- push him away from it. Teach a shot blocker to block shots with either hand. What made Bird and Magic special is they could shoot only 11 times and still dominate a game. If you could hold Jordan to 11 shots you had a chance to win. Games are won in the paint. When asked about Larry Bird's work ethic at practice, McHale responded that he hadn't realized it was all that special because all the Celtics worked that hard. He didn't realize how hard the Celtics worked till they brought in players from other teams that could believe how hard they practiced. After practice the Celtics would stay in the gym and play shooting games and other things -- "we were gym rats." McHale thanks there are great days ahead for the NBA because of the caliber of "people" in the league...spoke specifically of Kevin Durrant and Derrick Rose..."they aren't just great players, they are world class people." Every good leader I have known understands instinctively the need to communicate to followers a common purpose, a purpose that comes down from the leader and is internalized by the entire team. Armed with a common purpose, an organization's various parts will strive to achieve that purpose and will not go riding off in every direction. If your Jerry Rice, the greatest receiver in NFL history and, according to some, the greatest player, you're practicing a slant pass pattern at 6 A.M. over and over with nobody within a mile of you -- not football, no quarterback, nobody but Jerry working to improve, to master his profession. Why is the NFL's greatest-ever receiver doing this? 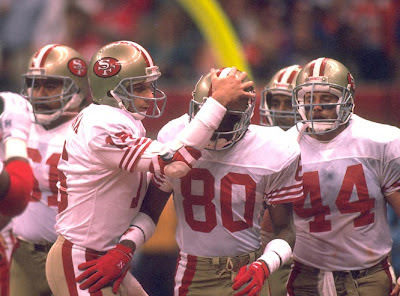 Jerry Rice understands the connection between preparation and performance; between intelligently applied hard work and results; between mediocrity and mastery of your job. And Jerry has the skill coupled with the will to do it. Joe Montana, perhaps the great quarterback in NFL history, in his last season as a professional, when he was playing for the Kansas City, would spend two hours a day every day at the same little practice field at Menlo College near San Francisco. I would work with him on basic fundamentals that would bore a high schooler to death. 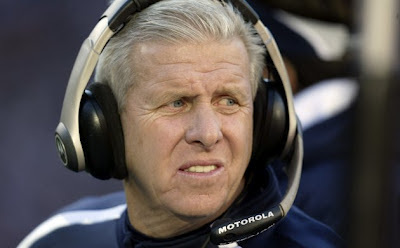 Joe had four Super Bowl rings. How did he get them? Why was he on that little practice field? Joe Montana understands what master means. You never stop learning, perfecting, refining -- molding your skills. You never stop depending on the fundamentals -- sustaining, maintaining, and improving. Jerry and Joe, maybe the best ever at their positions, at the last stages of their careers were still working very hard on the fundamental things that high school kids won't do because it's too damn dull. 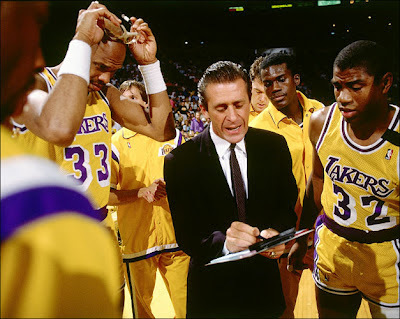 It wasn't dull to Jerry and Joe, because they understood the absolute and direct connection between intelligently directed hard work and achieving your potential. 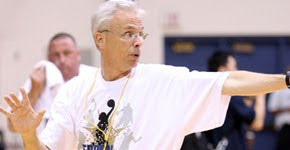 During his tenure as an assistant coach for the Boston Celtics, Kevin Eastman has had first hand experience with "special players" -- both on his team and those he competed against. The list below is one to be shared with your best players. You could even change the name form "special players" to "special teams." ...don't blame others first; instead, they look first for what they contributed (or did not contribute) to the situation. ...don't complain; instead they look for ways to correct things that aren't working. ...don't procrastinate; get things done now. ...always give more than they ask of others. ...always look to take on as much as they can handle, rather than look to pass things on to others all the time. 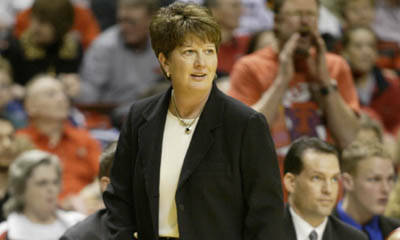 ...are constantly trying to improve their game as they can bring more to the team and constantly fulfill their role. ...are self starters and study the game (and themselves) enough to know what needs to be done; then do about doing it. ...do the un-required work, knowing that it simply needs to be done -- extra shots, extra weights, extra film watching, etc. without constantly needing to be told by a coach. ...hold others accountable for their jobs and roles because they know the importance of accountability as it relates to winning; this creates a collective responsibility. 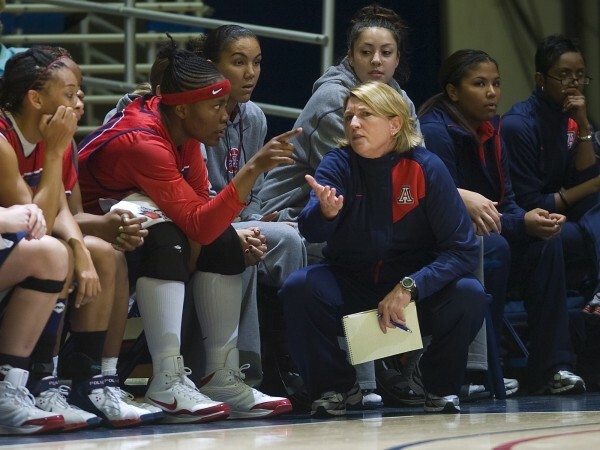 ...always be among the most trusted players on the team -- by coaches and players. Nothing of any real consequence happens until a person becomes passionate about achieving a specific outcome or objective. Lukewarm desire does not work! Passion stimulates power! Tentative actions stem from tentative thoughts. Both lack the power to self motivate or influence others. Tentative thoughts produce weak emotions, which create a disappointing outcome or circumstance. People who ultimately achieve their dreams start with and sustain a powerful passion for doing so, regardless of the circumstances they meet along the way. A white hot desire to have the things you want must be matched with an equal desire to develop the knowledge and skills necessary to justify having them. Understanding this premise is essential to all achievement. The lack of this understanding is the primary reason for most of our failures. Remember: Desire breeds Determination, which is expressed in Dedication! One of the greatest misconceptions about becoming successful is the idea that you should “feel good” or “motivated” before you act. Motivation almost always follows action, but seldom precedes it. As Emerson said: “Do the thing and you shall have the power.” Champions commit to disciplined actions and pay very little attention to how they feel. A person’s power resources are largely invisible. They are housed in the mind and spirit of man. The door to release this power resides in the unconscious mind, but the key to that door is the conscious mind declaring with conviction and accuracy what I t wants. Goals are absolutely indispensable to success. The unconscious mind demands specific intent, or a goal, in order to function as an optimum achievement mechanism. A conquering current always flows with a powerfully declared specific goal. Remember: When setting goals, “what I want” will always be equal to “what I don’t want to do, struggle with or overcome to get it”! The dynamic expression and ultimate evidence of a person’s level of commitment is seen in a constant striving to become exceptional in performance. Thus, actions, not words, are the barometer with which you measure the level of one’s commitment. Total commitment also means that you must be able to accept or include whatever obstacles or roadblocks you might encounter along your road to eventual success. Success, in reality, is seldom a sprint; most often it is a marathon. To finish, you cannot be content with mediocrity; true commitment won’t allow it. Laziness and despondency are the saboteurs of commitment, but the ultimate slayers of your commitment will be the critics you listen to from within (“self talk”) or from without when the going gets tough. Self doubt, however imposed or accepted, will sap the strength of your commitment. When doubt comes, and it will, you need to abandon your emotions and rely almost entirely on your faith to be greater than your doubt. Remember: What one actually does indicates with absolute clarity what one is committed to! A determined human spirit is indomitable. Winning in life depends almost entirely on your ability to work hard and persevere. Excitement wears off, but persistence wears down the obstacles between you and success. The price of success is dedication, deprivation, lots of sustained effort and plenty of doubt and loneliness mixed in to test your resolve. Long hours of preparation are often required to hone the skills and develop the knowledge and techniques that will lead to efficiency and performance and ultimate victory. To succeed greatly, you must sacrifice greatly. The best way to prepare for the sacrifice is to mentally include it as part of the price. “Surrender to purpose” creates an emotional cushion which softens the blow of negative emotions associated with disappointments that accompany striving for greatness. 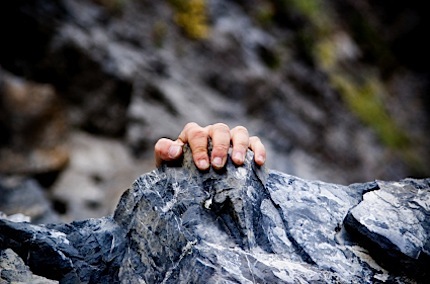 Persistence is “falling in love” with the tedium of constant practice to become better. You have to be willing to do things over and over again. Consistency is the hallmark of all teachers. 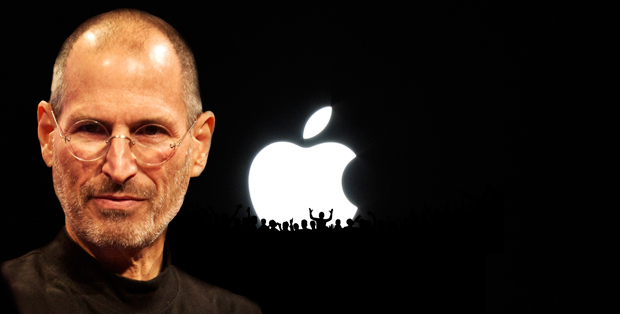 It is a quality which allows a person of average ability to be come a huge success. It is a concentrated patience. It deprives failure of the opportunity to become a permanent condition, but most of all, it is the one quality of spirit that transforms a person’s dreams into a loving, dynamic reality. To become a success at something, you must become a master at it. That takes practice and perseverance. Remember: The house of Mastery sits at the end of Persistence Street! It is absolutely amazing to see how many people today are still not aware of the interwoven relationship between the nature of their thoughts and the conditions in their lives. In spite of the fact that every great spiritual teacher, philosopher, poet an d psychologist has taught us about that exact relationship and its significance, most people are still in the dark on this pivotal truth. It is our thoughts that create our motivation to act or not act in any given situation. It is our thoughts about ourselves that determine our capabilities, limitations, “okayness” or “not okayness,” worthiness or unworthiness, lovability or unlovability. Thus, we think our personal reality into existence. No one else thinks your thoughts but you. No one else is creating your life as it is perceived by you except you. Your thoughts are actually creating your experience of life. It is your thoughts that trigger your emotions of love or hate, happiness or depression, guilt or serenity, and so it goes, on and on. The relationship between your thoughts, feelings and behaviours is reciprocal. You define yourself and your life by the thoughts you think. Everything you experience in your life is experienced in your mind. We are all trapped by our thoughts, our judgments and interpretations of the events in our lives. It is, therefore, essential that we take control of our thoughts. Success begins in the mind and it is impossible to achieve while your private beliefs and thoughts are hostile to it. Be aware that any thought that serves to diminish you, your strength, your confidence, your intelligence or your security will produce anxiety and stress. You will deal with that stress and anxiety as your thoughts about them dictate. You will either choose to use the stress and anxiety to perform, or you will retreat into resignation which, in turn, must create more thoughts to perpetrate your misfortune. Thus, we become what we think about! “We reap what we sow” is never truer than in the domain of thought. To change the conditions of your life you must be willing to correct the thinking that created those conditions. This is what Disraeli meant when he said, “Man is not the creature of circumstances. Circumstances are the creatures of man.” Thoughts, themselves unseen, nonetheless work their effects unerringly. Consequently, you receive what you think about most of the time. Reveal your dominant thoughts and a person who understands this concept can write an accurate description of your life. Our lives as they are, therefore, are a perfect advertisement of our dominant thoughts. There is a constant creating dialogue between our thoughts and our conditions in life. Change the thoughts, and you eventually change the conditions. Remember: You may not always control what happens in your life, but you have absolute control over what you decide to think about what happens. Take control of your thoughts and you take control of your life! Enthusiasm is the least expensive yet most effective cosmetic in the world. It is beauty dancing for its own enjoyment. It is the fuel that propels great actions. It is an unequalled attention getter. It is life’s primary expression of appreciation of itself. When combined with sincerity, it is the most enduring of all positive personality traits. It compels us to look for the best in all situations. It makes you a human magnet, pulling close the people and circumstances you need to be involved with to reach your goals. It will transform a sincere wish into a vivid reality. You discover your real self and your talents when you are enthusiastic. As an added bonus, you feel truly alive. Being “laid back” may be considered a cool attitude in some circles, but the people who get what they want in life are expressive and alive in their actions. They abandon pretense and get flat out excited about what they are doing. True self expression flows from an enthusiastic spirit. When you are really fired up for the task at hand, you discover who you really are and what your powers to create can actually achieve. In the final analysis, there are only two types of people on the planet: Those who are inspired and those who are not! Uninspired people get what is easily available and not very satisfying. Remember: Enthusiasm is an art. It must become a learned attitude, totally independent of favourable or unfavourable stimuli. The achievement resources we have as humans are awesome powers when developed and directed toward specific objectives. The weaving, connecting and maturing influence is TIME. When understood as a limited resource wherein the virtually unlimited resources of our minds express themselves, it becomes crucial to develop a healthy relationship with time. Most people, since they are not specific with their intent, have a neurotic preoccupation with time and its apparent limitations. They are likely to squander it or struggle with not having enough of the stuff to accomplish what needs doing. The crucial element of time is clearly its use. This is one area where we all unquestionably are created equal. We all get the same amount for doing the deeds of a day. How does one allocate time and on what activities does one spend or invest it? Time in this context becomes a critical factor in achievement. Choice becomes of critical import, as well. When one chooses to do a particular thing, it requires time. That single choice eliminates all other choices for a specified number of minutes, hours, or days. Now it becomes clear that time is a limited and therefore precious resource which should be invested very wisely. Would I put my money (resource) in a bank that paid no interest, or in a bond that had no history of positive performance? No! Why? Because it would be an unwise investment. Yet I will seldom audit my use of time, my most precious commodity my life expressing itself in the context of a limitation. Wow! I need to wake up! Life is NOW experience and if I am to be blessed to be here tomorrow, all I’ll have is another NOW to make it happen. In conclusion, life is about growth, about “become,” within a limited period of linear time called Earth life. If life is to have meaning, it must have purpose. Purpose on this planet is manifest in the context of time. Becoming all you can be, given y our unusual self, is the ultimate joy life offers. The journey is recorded in time. Its wise use is all you and I have with which to “become” our purpose. This is a universe of laws and operating principles. Learning comes through concentrated study. Mastery, however, comes through tedious repetition of the principles and rules of the game you are playing. 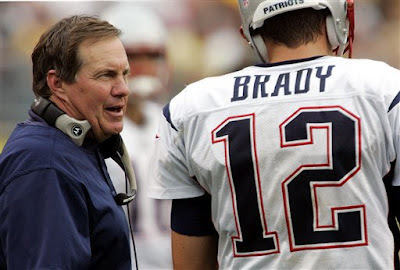 The game you’re playing is LIFE, and every day I s Super Bowl Sunday! Remember: Life is the ride and Time is the train. Make the most of your trip and become all you can possibly become on your journey. STEPHEN COVEY ON "TOTAL QUALITY"